The polls for Columbia College Student Council and Engineering Student Council are now open until Wednesday, April 11 at 5:00 p.m. When approaching the process of endorsing candidates, we evaluated each candidate on their platform and the points raised during the recent debates. These endorsements are the results of a discussion as an editorial board, analyzing the candidates on their abilities to accurately assess which issues are important to their constituents; the feasibility of executing action items; their knowledge both of University policies and administrative systems as well as the purview of their potential positions; and on their ability to convincingly present their platforms and ideas during these debates. 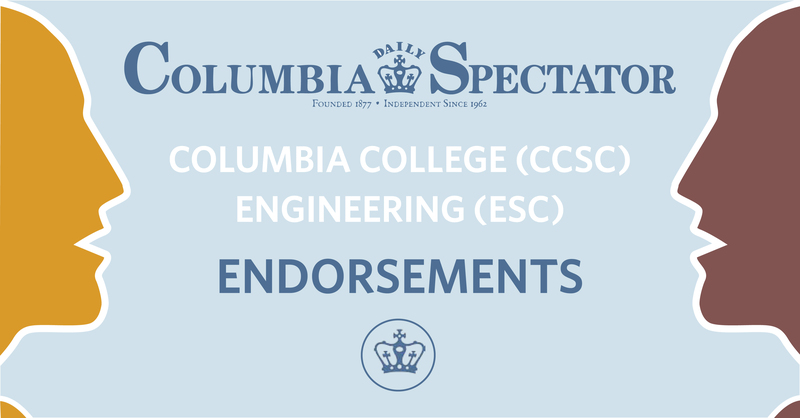 As per the rules put forth by the Columbia Election Commission, we will only be endorsing candidates for at-large representative positions, executive board positions, and positions on the University Senate. After careful consideration and significant disheartenment by the sheer number of uncontested races across councils, we have also decided not to endorse candidates who are running unopposed. Thus, after reviewing the candidates and their platforms, the 142nd editorial board presents the following endorsements for CCSC and ESC elections. We endorse Alfredo Dominguez, CC ’19, as Dominguez’s platform focused on pertinent issues to members of the community—with an emphasis on meaningful mental health reform—and demonstrated focused priorities on advocating for underrepresented communities, such as Latinx and first-generation, low-income students. We also endorse Toqa Badran, CC ’19, due to Badran’s experience on CCSC and the consistent feasibility of her platform. While we noted that some of the only mentions to improving mental health were in reference to increasing student lounge spaces on campus, Badran’s experience and focus demonstrate a readiness for the position. While Danielle Resheff, CC ’20, provided a solid presentation and platform, we were unconvinced by the candidate’s proposals of improvements for existing initiatives. For example, the candidate’s approach to students’ collaboration with the JED foundation failed to address the initiative’s lack of transparency, and plans to provide free tampons and pads seemed unsustainable based on the attempts of previous councils to do the same. We noted the importance of many items outlined in Resheff’s platform, such as accessibility on campus, and noted that Resheff could run again in the future with more experience. Grant Pace, CC ’20, focused on important concerns such as food insecurity and LGBTQ advocacy. Some of his proposals, however, closely mirrored existing programs, such as the existing Emergency Meal Fund, without providing further specifics. We also noted Pace’s potential inability to devote the necessary time to the position after seeing Pace’s other commitments outlined on the platform. Jonathan Schleien, CC ’20, also presented important points, but we would have liked to see more specifics on plans for assessing mental health, as we consider it to be one of the most pertinent issues facing the student body in the coming year. Staff Director Hannah Barbosa Cesnik recused herself from discussions on the University Senator position due to her relationship to one of the candidates. We do not endorse either candidate for CCSC VP of Campus Life. While both Laura Hand, CC ’19, and Sim Mander, CC ’20, have identified topics of concern and groups that they would like to work with as VP of Campus Life, we found that neither candidate put forth compelling plans to improve life for undergraduates in Columbia College. Note: Laura Hand is a former illustrator for Spectator. We endorse Monique Harmon, CC ’19, due to her experience in student council as well as the actionable items listed on making CPS more accessible to students. Having served in this position for a semester, Harmon also displayed an understanding of the role of Student Services Representative within student council. We also endorse Henry Feldman, CC ’21, as we found that the candidate presented a thorough understanding of existing programs in place to address issues such as food insecurity, while proposing new ideas on how to improve them. Eva Steinman, CC ’21, did not offer a platform that demonstrated a thorough understanding of how to adequately address the issues outlined in the Steinman’s platform. We endorse Nikola Danev, CC ’19, as the platform presented outlined various specific items pertinent to the community of international students at Columbia, particularly the inaccessibility of the ISSO office. Fahima Ali, CC ’21, demonstrated a passion for helping international students feel at home at Columbia, but Ali’s small platform did not offer many clear, actionable steps on how to achieve this goal. We do not endorse either candidate for ESC Senator. We found that Zoha Qamar, SEAS ’19, has demonstrated a knowledge of how the University works, and has done well in outlining the issues specific to students in SEAS, but did not present many convincing, tangible steps to address them. We also found that the items in the platform of Cindy Soifer, SEAS ’20, lacked specificity. Thus, neither candidate presented a convincing case to warrant an endorsement. Note: Zoha Qamar is a former staff member of Spectator. We do not endorse either candidate for Campus Affairs Representative. Benjamin Greenfield, SEAS ’20, and Jordynn Lurie, SEAS ’20, provided platforms with various vague hopes for actions to take on in the role, such as increasing recreational spaces and improving campus safety, but did not provide actionable steps to achieve their outlined goals. We endorse Jennifer Martinez, SEAS ’21, as this candidate’s platform contained specific concerns pertinent to the first-generation, low-income community. While neither Jennifer Martinez, nor Joan Martinez were present at the debates, Joan Martinez did not provide a platform on the Columbia Elections Commission website, so we are thus unable to evaluate the candidate’s platform. We endorse Ishraq Khandaker, SEAS ’19, as this candidate’s platform offered an account of previous experience in a similar position and issues specific to the experiences of 3-2 combined plan students, such as the need for guaranteed housing. Tracy Paltoo, SEAS ’19, did not provide a platform which outlined issues as specifically as Khandaker, and thus did not present a convincing case to warrant an endorsement.